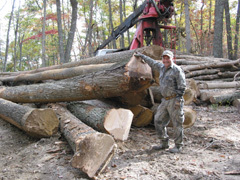 The Flint timber harvest is part of an ongoing wildlife and forest management project. With over 1000 acres of woodland under management, this property exemplifies what can be accomplished with proper longterm planning. 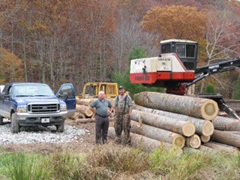 Mr. Flint and Logger Bryan Humphreys check out some of the nice logs ready to ship to market. The Asbury Property is a 430 acre management project including wildlife, timber, recreational and residential home sites. 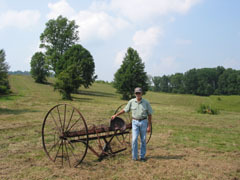 Landowner, Lee Bennett, is the second generation to conduct a selective timber harvest on the family property. The last harvest was conducted 25 years ago. 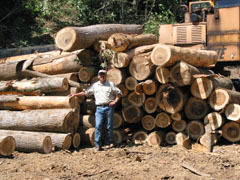 Landowner, David Quesenberry, takes time off from hunting to pose with some nice trees ready to be merchandized to the highest paying markets. Maplewood is a 112 acre land and timber project being developed in the heart of the white water rafting county near the New River Gorge. 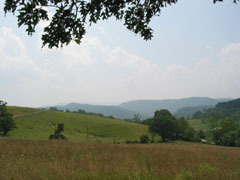 The demand for housing and recreational properties is ever increasing as the world discovers WV. 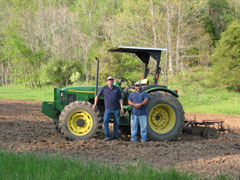 Cold Springs is a 160 acre farm in the heart of the Greenbrier Valley. With 360 degree views and a mile of mountain stream flowing through, Cold Springs is just the right place to hang a hat.